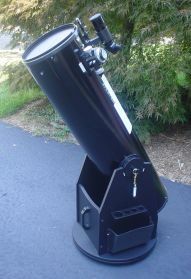 Since 2007 my primary telescope has been the Z-10: a Zhumell 10 inch (250 mm) Newtonian reflector on a Dobsonian mount. Many might argue that so much aperture is wasted in washed-out skies, but I found the Z-10 suits my needs quite well. It is sometimes claimed that in light-polluted skies larger apertures only further brighten the background and diminish contrast; that in washed-out skies you can actually see more with smaller apertures. I’ve found that to be simply another urban legend: the Z-10 does quite well in pulling in DSOs from my front yard despite the heavy light-pollution. It consistently shows objects that I can’t see with smaller apertures. The Z-10 also just fits in my car (a VW Passat), allowing me to easily take it to nearby parks or to far-away dark-sites. My oldest scope is an Edmund Palomar Jr (Pal Jr). It’s a 4.25 inch (108mm) Newtonian reflector on a German equatorial mount. It’s been in regular use ever since I got it in 1973. These days I use it primarily for solar observing using a Baader AstroSolar Safety Film aperture filter. I also use it to compare views with my Zhumell 10 inch (250mm) Dobsonian (Z-10) and to verify what a smaller aperture can show under washed-out skies. The optics on the Pal Jr are surprisingly good, consistently showing picture-perfect diffraction patterns. It gives great views of the planets and splits η Orionis whenever the seeing is decent. In dark skies, it’s shown me most of the Messier objects and plenty of NGCs. In washed-out skies it still gives good views of double stars, open clusters, the brighter globular clusters (without any hints of resolution), and the brighter nebulas (M27, M42, M57), but apart from M31 it is exceptionally hard to see any galaxies with it. I’ve made a point of including observations with the Pal Jr throughout Washed-out Astronomy to balance the Z-10 view with a smaller aperture view. The most interesting thing about the Pal Jr is that it was hit by lightening some years ago….